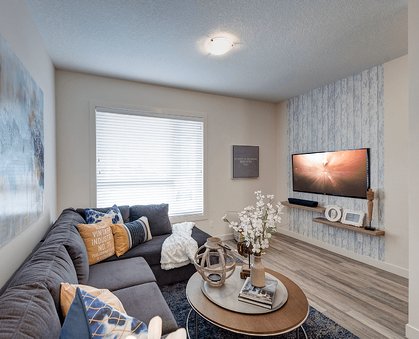 If you’ve been looking for a great townhome in Northwest Calgary, look no further than The Loop in Evanston. They’re finishing up Phase 1 of the development – a testament to how popular this community is – and Phase 2 has just been launched. The launch of Phase 2 features a limited release of the amaranth14, one of The Loop's most popular models. These townhomes are now pre-selling and will be ready for move-in at the end of 2018. The Carmine16 model has a two-car tandem garage and 1,267 square feet of living space. The main living area has an open-concept plan with a comfortably sized kitchen and a breakfast bar at the island. Upstairs, the two bedrooms both have walk-in closets and there's a flex space you could use as an office or playroom. Though the Amaranth14 is slightly smaller at 1,205 square feet, it’s easy to see why it’s so popular. The layout of the main living area has entertainment in mind with high ceilings, an open layout and great sightlines across the entire floor. Best of all, the top level features dual suites. Each of the two bedrooms has its own ensuite. This is ideal for those who want to have a roommate while building up some equity in a home. 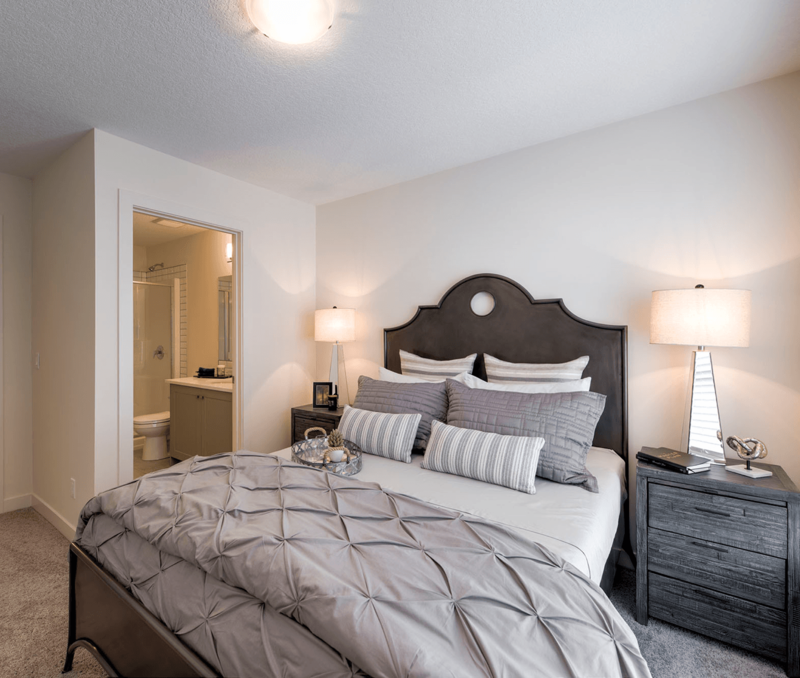 After touring the showhomes, you'll get a sense of the quality you can expect from StreetSide Developments. They have move-in ready homes available ranging from this spring to later in the year. Typically, when you build a new home, you have to wait up to a year for the builder to complete the home. Talk to an Area Manager about how you can make your home in Evanston. When you choose a new home from StreetSide, you may get the opportunity to personalize the home to suit your needs. You can select colours and materials for things like the flooring and cabinetry. 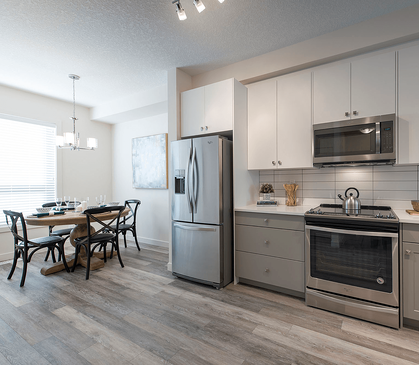 For a move-in ready home, these selections are typically already made using the most popular finishings and on-trend colours. You’ll also love the new home warranties that come with the home. 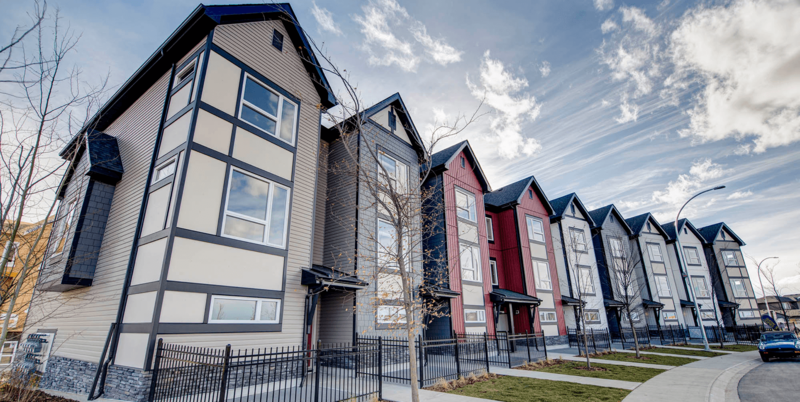 At the same time, you’ll find StreetSide’s homes affordable. These townhomes feature attached garages and a no-maintenance lifestyle with prices starting in the $290s. Whether you’re looking for that perfect starter home or you want to downsize after your children have moved on, The Loop has what you’re looking for. Evanston is ideally situated for those who want to lead a comfortable life. Outside of the city centre, you’ll find life feels a bit quieter but you’re still able to easily hop onto Stoney Trail to get to work. Evanston is also close to the airport. Nearby, you’ll find a variety of stores, restaurants, banks and services for everyday needs. For instance, the Evanston Towne Center is so close you could walk or bike but you’re also near the Creekside Shopping Center, a Walmart and a Costco. Almost everyone appreciates the design of the community itself. There are parks, playgrounds and other green spaces around. In fact, it is directly across the street from a 1.5 acre park that inspired the project's name. It’s a great location for those with kids but anyone who likes to get outside to enjoy nature will be happy at The Loop as well. The Loop’s Phase 2 Grand Opening celebration is the perfect time to see everything this community has to offer without any pressure. Whether you’re actively looking for a builder or just want to see what’s out there, we think you’ll like what you see.